Hailing from a country more used to celebrating the motorcycling feats of road racers who ply their trade between the hedges, Jonathan Rea has bucked the trend. The 28-year-old is a popular sporting figure in his homeland, where acknowledgement of his outstanding ability as a rider is matched by an admiration for his dedication and humble down-to-earth nature. These are some of the qualities which have helped him realise his long-held ambition of becoming Northern Ireland's first world champion in two-wheel motorsport since Joey Dunlop and Brian Reid claimed the Formula One and Formula Two world titles in 1986. Since laying down a benchmark with a race win in the opening round of this year's World Superbike series at Phillip Island, the County Antrim man has set about rampaging through the record books, providing what could aptly be described as a motorsport masterclass. Twelve wins from 22 starts this season - and a remarkable record of having stood on the podium in every race for the first 20 of them - tell the tale of the dominance he has enjoyed over his rivals. Already renowned for his skill, astute racecraft, perseverance and ability to adapt his style to wet conditions, Rea's move to the official Kawasaki team has proved to be the catalyst which has catapulted him to this much-deserved success on the global stage. For many years, the Isle of Man-based rider showed consistent loyalty to Honda, the manufacturer which helped mould his career in the early years through a rookies scholarship, and maximised the potential of their Supersport and Superbike machinery, taking occasional race wins in the process. Maintaining those strong links with the Japanese motorsport giant failed however to yield the move which Rea hoped for - a switch to MotoGP, the premier class of world motorcycling. Seventh and eighth place finishes while standing in for injured world champion Casey Stoner in the Repsol Honda team in 2012 enhanced his reputation but failed to lead to a more permanent arrangement to compete in the series. Surely only the complex politics which surround the MotoGP paddock prevented him from testing himself against the very elite of the sport. The young Jonathan Rea's successful participation in youth motocross demonstrated his ability on a motorcycle from an early age and marked him out as a potential star of the future. After serving his apprenticeship on the circuits of Great Britain and Ireland, he achieved second position overall in the 2007 British Superbike series, followed by a similar placing in the World Supersport class the following year. 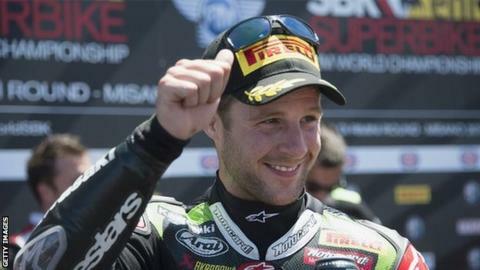 His best finish in World Superbikes prior to this season was third in the 2014 championship on board a Ten Kate Honda. Throughout his distinguished career, the Ulsterman has demonstrated an unwavering gratitude to his sponsors and exhibited a profound appreciation of the collective efforts of the team gathered around him. Like most of the sport's leading exponents, he has overcome his fair share of injury setbacks along the way, but a regular fitness regime in the form of cycling and hard graft at the gym have paid handsome dividends. A respectful attitude to his opponents in an environment where egos can easily become inflated and rivalries rampant have been a hallmark of his approach, while his articulate, well-spoken manner has made him a firm favourite with the media. The son of an accomplished road racer, the Ballyclare man has regularly expressed his admiration for those who participate in the unforgiving discipline of racing on public roads and has displayed a willingness to pass on some of his knowledge to the next generation of potential motorcycling stars. Boasting a substantial fan base, Rea has also won the Irish Motorcyclist of the Year award, in its various guises, on several occasions. His supporters can now salute Northern Ireland's newest world champion.